A devastating 7.8-magnitude earthquake rocked Nepal on Saturday, April 25. More than 5,000 people have been killed as a result. And, survivors are in desperate need of food and clean water. In response, we have teamed with ChurchAsia who is on the ground in Nepal, already reaching those in need with initial rounds of supplies. They need our help to provide more food and clean water to those whose lives have been turned upside down by this natural disaster. Because of the urgency of this mission, we will be sending funds for our partner to purchase emergency supplies (food, water, tents, blankets and more) from a neighboring country to then distribute them to those in need. Part of the provisions includes family packs of rice, dal and cooking oil that can feed a family of five for a week. Surely you have heard the news reports and even seen images of this disaster. The need is great and urgent. We do not have time to spare. Any amount that you can give today will make a difference, whether it’s $10 or $50 or $100. 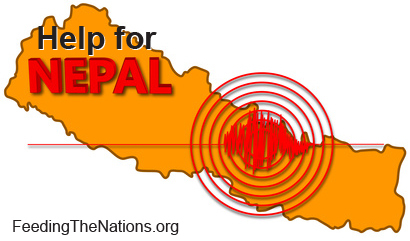 Join with us now in reaching this nation with emergency relief and in praying for Nepal.